The visitors to the P-site are (from left to right) Stuart Gilfillan (University of Edinburgh, Scotland) Susan Pfiffner (University of Tennessee) Yousif Kharaka (U.S. Geological Survey, Menlo Park, California) Tommy Phelps (Oak Ridge National Laboratory) Kim Gilbert (Ph.D. student, The University of Texas at Austin) and GCCC's Katherine Romanak. December 6, 2009: Katherine Romanak hosted a tour of Cranfield's P-site, which GCCC researchers have established as a study site for determining how environmental factors affect near-surface monitoring at an engineered location. Romanak demonstrated methods used by BEG scientists to monitor the site and showed the scientists the first soil-gas data set collected.The scientists discussed preliminary interpretations of the data and numerous potential areas of collaboration were suggested. Attendees at the UK-TX CCS Technology and Legislation Pre-Workshop Event. From left to right: Catherine Santamaria (British Consulate), Erin Miller (BEG), Dr. Carey King (Center for International Energy and Environmental Policy, University of Texas), Dr. May Arkawi (British Consulate), Rebecca Smyth (BEG), Dr. John Olson (Department of Petroleum and Geosystems Engineering, University of Texas), Dr. Susan Hovorka (BEG), Dr. Tip Meckel (BEG), Dr. John Gluyas (University of Durham), Dr (Department of Petroleum and Geosystems Engineering, University of Texas), Nick Huerta (Department of Petroleum and Geosystems Engineering, University of Texas), Ian Havercroft (University College, London), Dr. Mike Stephenson (British Geological Survey), and Stuart Coleman (BEG). October 21, 2009: GFZ German Research Centre for Geosciences. Ramón Treviño presents a review of SECARB Phases II and III and tours CO2 injection experiment. Potsdam and Ketzin, Germany. To read the full story, click here. September 23, 2009: GCCC graduate student Silvia Solano received one of four awards from the Association of International Petroleum Negotiators (AIPN) under its inaugural scholarship program. The scholarship provides tuition funding for the 2009-2010 academic year. GCCC researchers JP Nicot and Ramon Treviño meet with Veronica Brieno Rankin. August 23-29, 2009: GCCC student Stuart Coleman attended the IEA Greenhouse Gas Programme Summer School in Lorne, Victoria, Australia hosted by CO2 CRC. As part of the IEAGHG Summer course, Coleman visited Otway Basin Project, Australia's first carbon capture and storage demonstration plant. Coleman presented his team's project "Can CCS be part of an integrated, sustainable and secure energy system?". Coleman's team was awarded first place among all the groups in the program. August 27, 2009: University of Texas GCCC receives awards for three projects involving carbon sequestration technology and education by DOE/NETL. To read the full story, click here. 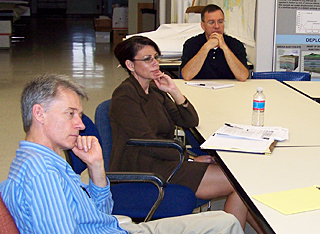 July 22, 2009 : GCCC Participates in Recovery Act. The Gulf Coast Carbon Center (GCCC) is joining with many of their partners to compete for awards that will fund key research in carbon sequestration under the American Recovery and Reinvestment Act. To read the full story, click here. July 21, 2009: Texas Passes Significant CCS Legislation. In the spring of 2009, the 81st Texas Legislature passed landmark legislation to increase the options for Texas industries to reduce their carbon emissions through carbon capture and sequestration (CCS). To read the full story, click here. GCCC student Alex Urquhart amazes a crowd with soap bubbles floating on CO2 gas, showing that gas is real, although invisible. [Photo by Changbing Yang]. 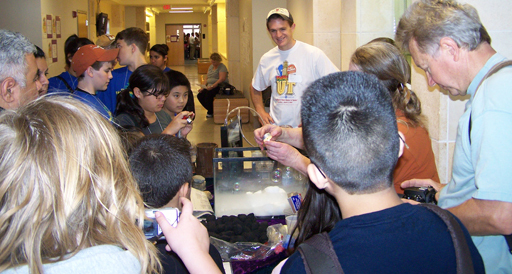 March 7, 2009: Seven GCCC staff presented a booth showing "What to do with CO2" at Explore UT, the annual University of Texas at Austin public open house. More than 10,000 Students, teachers, and adults were in attendance, and all those who attended the GCCC presentation were quite engaged. March 5 and 6, 2009: Sue Hovorka joined an expert review panel to contribute an overview of results from field studies at an informational workshop organized by National Resources Defense Council and Environmental Defense. The first day focused on providing information to financial and insurance stakeholders and was hosted by Bloomberg, in Manhattan. The second day was in Washington DC hosted in the House office building. Feb 10-17, 2009: Sue Hovorka presented at IEA Greenhouse Gas R&D Programme network meeting proposing establishment of a modeling network . Her paper discussed the intersection of modeling with monitoring, highlighting the difficulty of making a unique history match from monitoring data that was convincing in a regulatory environment and able to document that the reservoir is performing correctly. She then went to visit the British Geological Survey CCS group in Nottingham, to visit Stuart Haszeldine's group at University of Edinburgh, and returned to visit the Department for Energy and Climate Change (DECC) in Westminster. February 9, 2009: Ramon Treviño, Project Manager, Bureau of Economic Geology, The University of Texas at Austin, gave a presentation on "Overview of Carbon Dioxide Storage (Sequestration)" at the Coastal Bend Bays Foundation Coastal Issues Forums. www.baysfoundation.org. Truan Natural Resources Center, Texas A&M, Corpus Christi, Texas. January 14-15, 2009: The GCCC convened it's 2008 Review/2009 Planning meeting at the Bureau of Economic Geology with more than 40 in attendance. Among other topics, attendees received a review of GCCC efforts during the previous year, including outreach, training, funding, publications, and a summary of legislative activities. The second day's activities were focused on planning for the consortium's efforts during 2009, ending with approval of a plan for action items in the coming year.